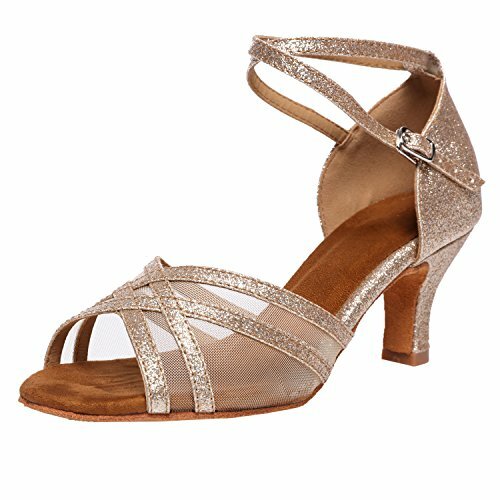 Glittering and fashionable perfectly balanced with superior flexibility .Akanu Ballroom Shoes is perfect for ballroom dancing such as quickstep, Viennese waltz, tango, waltz, foxtrot, rumba, cha cha, swing, disco, samba, jive, etc. Satin or Synthetic upper.open toe and sides. 2.3" Flared heel. Adjustable crisscross ankle straps. Multiple interwoven forefoot straps provides support. Speed buckle 1/2 shank for support and flexibility. Cushioned insole and suede sole. Begin with street shoe size. If you have any questions about this product by Akanu, contact us by completing and submitting the form below. If you are looking for a specif part number, please include it with your message.